Apprentice food & Beverage service, House keeper(Hospital), Stenographer & Secretarial Assistant(English), Secretarial Assistant, Computer Operator & Programming Assistant. There are total 100 vacancies. The candidates must have a minimum qualification of 10th + 12th & ITI Certification in their respective field. The candidates must be from the domicile of Uttarakhand only. The candidate should pass 10th & ITI from recognized Board of Institution. Maximum age limit is 30 years. As per the provisions of the Apprentices Act 1961. 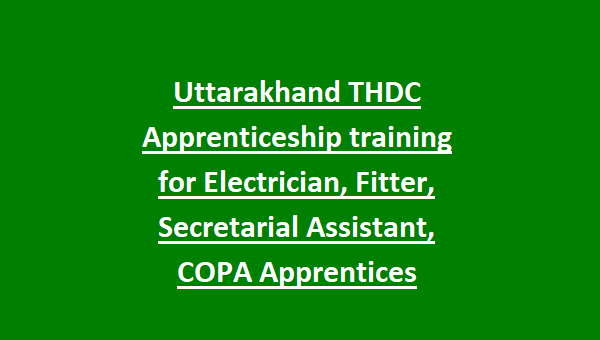 The last date for submitting applications for THDC Apprenticeship is 20-01-2019. 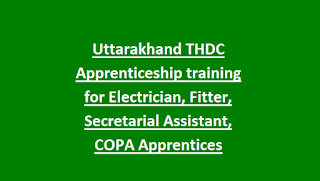 Domicile: The candidates from Uttarakhand are only eligible for the THDC Apprenticeship. There are total 100 apprentices vacancies available in THDC Recruitment. For ITI Technician & non-technician candidates 30% of 10th & 70% of ITI are taken into consideration for selection. For Non-ITI 100% of eligible qualification is taken into consideration for selection. For more details visit the official notification.